The very name of Constantine is enough to move the heart of any Greek Christian, not only today, but for very many years now, because it is associated with the legends of the nation, with “once again, with the passing of years and in good time, it will be ours again.” It moves us because the first to bear the name Constantine, was not merely one of the greatest men in world history, but he was something more besides: a saint. We would answer: they either forget or do not know that, in our faith, there is a great thing called repentance. One tear from a sinner, whatever act they’ve committed, one tear at the sacrament of confession, redeems any fault. Were there no repentance, paradise would be empty, we wouldn’t have a calendar of feasts nor any saints, because there isn’t a saint who hasn’t wept and hasn’t repented of sins. There’s no other way to Paradise, beloved, than the door of repentance. Constantine wasn’t born a saint, he became one. He made mistakes, but he repented. Let’s not forget that he was brought up in the inhuman surroundings of the courts of Diocletian and Galerius, yet he disagreed with people like them. He’s a saint because his presence in the world is the light of Christ. This light is also shown in his call, which is remarkably like that of Saint Paul and which is why it is mentioned in his Dismissal hymn. Saint Paul was called by Christ in a vision when he was walking along the road to Damascus; he saw a shining light and heard a voice saying: “Saul, Saul, why are you persecuting me?” In the same way, Saint Constantine was called in a vision. A historic vision which is reported by contemporary historians. What was the vision? When he arrived outside Rome on 28 October, in the year 312 A.D., the army of his rival was three times larger and defeat stared him in the face. As he sat there pondering, in broad daylight, he saw a great sign: the stars in the heavens formed a cross and below the cross he saw the words: “In this conquer” (In hoc vinca). And from that moment on, he was convinced that the future of humanity rested with Christ. He then adopted the banner which proceeded his troops and, with this sign, “In this conquer”, he defeated Maxentius, entered Rome and proclaimed to the whole city that this victory did not belong to his legions but to the Honorable Cross. His edicts are light. The first edict, in February 313, was for the persecutions to cease. Just imagine. The persecution of Christians had lasted 300 years. It was forbidden to be Christian. The very word “Christian” was cause enough for conviction, nothing else needed to be investigated: “Are you Christian?” That was it. Possessions confiscated, incredible sufferings, horrifying tortures. How many martyrs? 12 million. For 300 years, Christians begged: “Lord, give us peace”. And He did. Peace came into the world through the chosen vessel of divine providence, Constantine the Great. How, then, can we not honor him? We ought to do so if for nothing other than that edict which he signed with his holy hands. His nobility of soul and forgiving nature were also light. They say that some idolater enemies once decapitated a statue of him. When the news was brought to him he raised his hands, took hold of his real head and said: “This is my head here. There’s nothing missing. Don’t punish them.” On another occasion he said that if he saw a cleric sinning, he would cover him with his robes, so as to prevent other people seeing his sins. This showed his intense concern that the Church should not be subjected to scandals. His legislation was also light. For the first time, Christian legislation was introduced. His vision was rare. What vision? To make a Christian state, on a global scale, and offer it to Christ for sanctification and deification. This is why he’s depicted holding an orb. And just as the Patriarch Abraham heard the voice of God telling him to leave his homeland and settle in a land that God would show him (Gen. 12:1), so, too, Saint Constantine left Old Rome, the city stained with the blood of innocent Christians criminally killed, and built a New Rome on the Bosphorus, which, after his repose, was quite rightly called Constantinople. And from here he took measures aimed at raising the spiritual state and sanctity of the people. What measures? He closed all the night-time places of corrupt pleasure. There were places of entertainment where women gathered under the protection of disgusting divinities, Aphrodite centers, Bacchus centers, and he closed them all. He closed the oracles and got rid of the magicians who were exploiting people and deceiving them. He forbade blasphemy. He said he would forgive anything, except blasphemy. If anyone blasphemed the name of Christ, they were immediately arrested and exiled. He honored Sunday by edict. He declared it a great and splendid day and forbade any shops to open. Horse races, places of relaxation, everything closed. It was at his command that the Honorable Cross was found and the first churches were built in Jerusalem. He was the initiator and founder of a Christian Empire that lasted one thousand one hundred years. Beloved, even if we ignore all the above, there are two criteria for the Church regarding his sanctity: a) the vision of God and the grace which the saint enjoyed; b) his miracles after death. 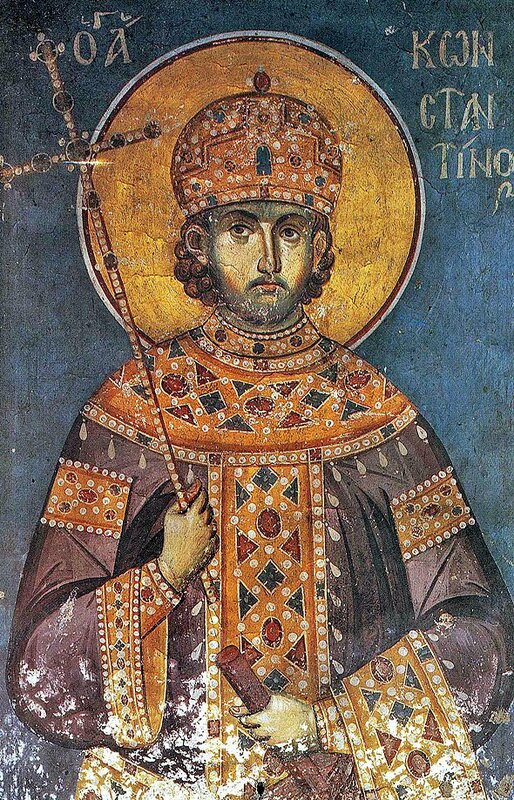 After his departure from this life, his sacred relics were buried with imperial honors in the narthex of the Church of the Holy Apostles, where they gave off a powerful fragrance and myrrh and performed many miracles. It may be that some people wonder whether what the Christians say is really the truth. Beloved, even if some people don’t believe, there are two criteria for his sanctity and only two. It is with the seal of God that Constantine is a saint and Equal to the Apostles. History has shown him to be great and the Church has shown him to be a saint. 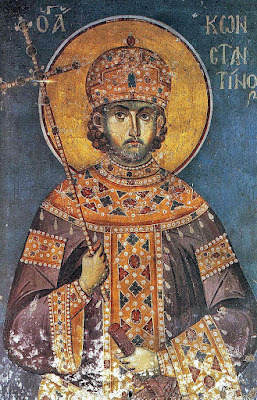 Words attributed to Constantine XI Palaiologos in a poem about the Fall of Constantinople, in which he hopes for the return of the City one day in the future to the Orthodox. Lactantius (On the Deaths of the Persecutors, 44), Eusebius (Eccl. Hist. IX, 9.1-11, Socrates (Eccl. Hist. I, 2.5-10), Sozomenos (Eccl. Hist. I 1) et al. In his book The Ecumenical Synods, Saint Nektarios writes that Saints Constantine and Helen were the hands of divine providence.